Abu Dhabi, UAE, June 3, 2018: Despite his young age Rashid Al Dhaheri's racing exploits have seen him rapidly rise through the ranks of the karting scene in the UAE and Italy. In a further career development Rashid has taken part in his first race in China where he powered to a clean-sweep of victories. 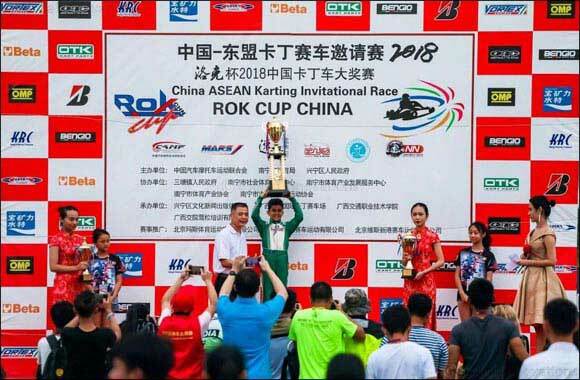 The Abu Dhabi schoolboy made his debut in the China ASEAN ROK Cup at the Nanning International Karting track, where he lined up with other drivers in the 60cc Mini Class. The event consisted two back-to-back days of qualifying and racing. On Saturday, Al Dhaheri qualified fastest to take pole position by three-tenths of a second over his nearest rival. In both heats, he controlled the pace and emerged as the comfortable winner in the final to score his first victory on Chinese soil. Sunday was almost a carbon copy of the previous day, with Al Dhaheri taking pole again, this time by three-quarters of a second. The skies opened up over Nanning in the afternoon just in time for the final, but this did not deter the Emirati youngster, who mustered all his experience of racing in the wet in Italy, to deliver an impressive performance, winning by a minute and almost lapping the entire field despite the challenging and tricky conditions. His victory on the second day underlined a fine performance where he was unbeaten in the Mini Class throughout the weekend. The event in southern China was attended by numerous racing fans and the organisers delivered a quality weekend of racing with a big media presence, including F1-style press conferences with drivers, grid and pit walk where numerous enthusiastic fans got to meet drivers. 'I was very impressed with Rashid's capacity to rapidly adapt to this new environment, new track and setting up the kart to get the pole position very effectively. This shows how he has evolved with experience and drives with a maturity that belies his age,' concluded Ippolitti. After his successful debut karting race weekend, in China, Al Dhaheri will return to action for the Italian Championship in Sarno on 9-10 July 2018.